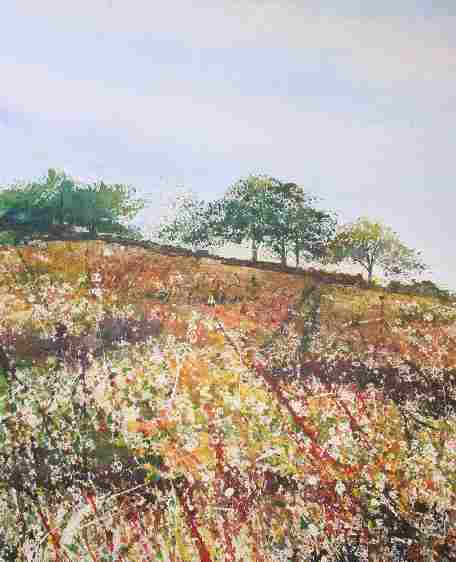 The acrylic landscape painting above 'Breezes' is worked from a photograph taken looking inland from Studland Bay. By looking at just this painting, we can understand a lot about why acrylics are a great medium to use when painting the landscape. The sky and distant hills show soft washes of colour. Acrylic paint is used in a fluid consistency. The grasses are painted with medium consistency acrylics. Swift brush strokes capture the feeling of the breeze. 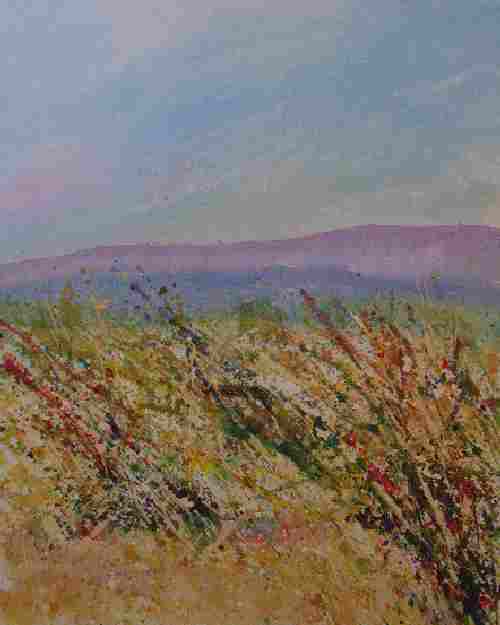 Some 'gesso' has been applied with a palette knife to add texture in some areas of the grasses. Acrylic paint in a very diluted form (acrylic inks could be used here) has been flicked on creating colour and interest. The tree foliage is splattered on. The trunks and branches carefully painted with a 'rigger' brush. Towards the foreground, acrylic paint is used in a thicker consistency and applied roughly with a coarse brush. Overall, this produced using a more painterly style. Does it capture the essence of the place? The feeling of the season? The richness of the furrowed field? Small acrylic paintings for cards If you would like to create some small paintings suitable for cards, please follow this link.